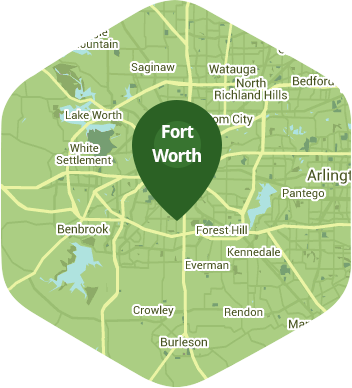 Book a skilled lawn pro in North Richland Hills. Backed by a total satisfaction guarantee and amazing customer support. North Richland Hills is a beautiful community that gives it residents easy access to a variety of places in and around Fort Worth. With so much to do and see just a car ride away, when you have free time to spend the last thing you probably want to do is spend it is on your lawn, working away. If you often find yourself torn between spending your free time on lawn care and maintenance and other activities with your friends and family, then you need to find out more about what Lawn Love can do for you. Lawn Love is a full-service lawn care company. Our fully bonded and insured lawn care technicians want to bring their experience and expertise to your lawn. They can take care of all the weeding, seeding, mowing, trimming and clean up, and all you have to do is give us a call. To get started, call Lawn Love today at 817-345-6362 and ask about our free, fast and easy two-minute quote to see how far a little Lawn Love can take you! Rated 4.73 / 5 stars in 4,082 North Richland Hills customer reviews. There won't be any rain in North Richland Hills today, which means you'll probably have to water your lawn. Dusk and dawn are the best times to water your lawn (the sun will rise at 6:55 AM and set at 8:01 PM today in North Richland Hills). Here are some average lawn care prices for homes in North Richland Hills. Average lawn size 3,986 sq. ft.